Predators was the first of the Predator films to introduce us to some live alien prey (excluding the Alien vs. Predator films). The community named him Stickman but the crew of Predators knew him by a few other aliases. The most common name used during the design phase was River Ghost. According to suit performer Carey Jones this was due to how the encounter with the creature played out in an earlier draft. As the name implies he was originally to have been found near a river and to be barely seen, almost like a ghost or apparition. He was also known as Red Herring as his presence in an earlier draft was supposed to have been more substantial. He was supposed to have been stalking the characters for longer and the group believed him to be responsible for their being on the planet. On set he was known as the Ram Rummer to which Jones said “I couldn’t quite figure out why until I was in the suit running full speed through the jungle”. Some of the designers also referred to him as the Guyver Alien due to the design influences. KNB boss Greg Nicerto had seen a sculpture by Takayuki Takeya called The Erosive Guyver that had influenced the design direction of the River Ghost. “I loved the exoskeleton look and the bone protrusions on the shoulder so we mimicked that along with some Metaluna Mutant colour schemes”. The conceptual design of the River Ghost was the responsibility of John Wheaton. Director, Nimrod Antal, gave the KNB crew a lot of latitude during the design phase. The biggest concern was to ensure the creature looked completely different from the Predator. It was important they couldn’t be confused. Wheaton was keen to ensure that the River Ghost was tall, insect-like and had an external, segmented carapace. Wheaton only had time to do a couple of renderings in Photoshop and Painter. This was due to Predators’ short production schedule and River Ghost’s scenes being first on the schedule despite the Predator concepts being well underway. The suit sculpting was handled by Mike O’Brien, Garrett Immel and Gino Crognale. The body sculpt took 10 or 11 days to complete with the main hurdle being the short deadline. Sculptor, Mike O’Brien, concentrated on infusing many different textures and shapes into the suit. 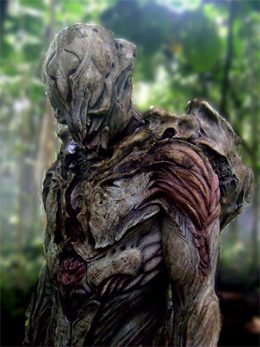 He wanted the suit to be very organic in appearance, taking influence from natural textures such as shells, rocks, bone, wood and bark. River Ghost not having much screen time didn’t stop O’Brien from including as much detail as possible. “I was actually teased for “going all out” on this suit” O’Brien told me. Since he didn’t know to what extent the creature would be seen, he wanted to make sure it “was ready for anything”. Due to the time pressures with the schedule there was no time to do a smaller scale marquette as is often common practice. As soon as the designs were complete they jumped straight into making the full size suit. Again, due to time, only a single hero suit was created. They did, however, have a stunt head and a set of mechanical and stunt hands. Speaking of the head, it was one of the few major changes from the conceptual stage. This was to accommodate several new elements Greg Nicotero and O’Brien wanted to include such as the removal of the eyes. The design also had to be altered to suit Carey Jones’ physique which was more muscular than the thin concept art. The arms were also changed. It was decided they were too long and looked a little too much. The length was reduced by half. John Wheaton commented “I remember Garrett Immel changing the hand sculpts by doing careful surgery and shorting the finger joints”. The arms were an important design choice for Greg Nicotero. They were long arms that wrapped around the chest, imitating the ribs. O’Brien described them as “long, vicious claws that would be revealed almost like switch blades”. The intention was the arms would unfold out in a very alien manner but unfortunately this wasn’t seen that well in the film. Carey Jones played the River Ghost and the Tracker Predator after being recommended by Greg Nicotero. The suit took around half an hour to put on while on set, a drastic reduction from the hour it took the first time Jones donned the suit. It was also different to the Tracker Predator suit in that it was actually thicker, the hands difficult to wear due to the length, and of course, the head. It was tighter to Jones’ head than the Predator head and his eyes were covered – He was performing completely blind. While preforming Jones was sure to keep himself in the mindset of a creature kidnapped from its world and taken to this alien world. Due to the appearance of the suit, Jones felt like he was a savage creature and tried to translate this across in his performance. When he chased after Edwin, Jones performed as if there was no obstacle between him and Edwin. His sole focus was on the capture of his prey. Unfortunately the crew never developed any backstory for the River Ghost. His species has no name. Hopefully he may show up in future films and be expanded upon. I’d like to thank John Wheaton, Mike O’Brien, Carey Jones and Greg Nicotero for taking the time to answer my questions and assist with this article. Check out our Predators gallery for larger images of those featured in this article. can I get this suit?